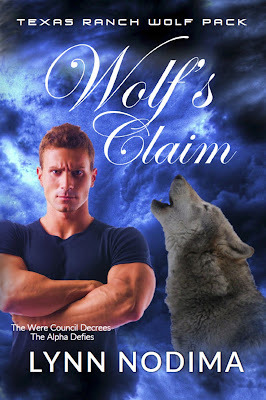 Lynn Nodima: Wolf's Claim: Published! After multiple edits and re-edits, Wolf's Claim, the second book in the Texas Ranch Wolf Pack series is available on Amazon, a full two weeks before my arbitrary deadline! This novella was fun to write and tells more about Nate and his abilities. In this story, you also meet Eli Thomas, Nate's foster-brother, and best friend. If you would like to read the first two chapters free, you can find them on the post titled Preview of Wolf's Claim, A Texas Ranch Wolf Pack Story. If you read, please leave an honest review. Other readers depend on reviews to help them find books they will enjoy reading. Thank you.